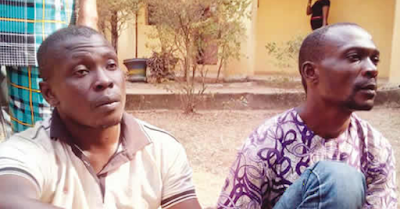 The Delta State Police Command has arrested a 40-year-old man, Mr. Festus Chuka, and an accomplice, Evans Odiwe, for allegedly killing a businessman, Innocent Nwankwo, over N2m. Punch Metro learnt that Chuka denied receiving a credit alert from his bank after the victim paid the money, which started an argument between them. The victim, who stayed in Anambra State, was said to have informed Chuka that he would travel down to meet him in Asaba with a deposit slip showing that he paid into Chuka’s bank account. Punch correspondent was told that the suspect gave the victim a meeting point, as they agreed to meet on January 7 to resolve the issue. Meanwhile, Chuka was alleged to have hired Odiwe and some others with N100,000 to kill the businessman upon his arrival. Nwankwo, who was unaware of the impending danger, was said to have arrived at the meeting venue from where Chuka lured him to a lonely place where the gang members were waiting. He was reportedly attacked and killed; and the suspects fled the scene afterwards. Chuka and Odiwe were among suspects paraded at the police command headquarters on Wednesday. He said, “Sometime in 2017, one Innocent Nwankwo, now deceased, of Nzemeghebo Crescent, Awada, Anambra State, paid the sum of N2m into a Diamond Bank Plc. account no: 0008438004, belonging to one of the suspects, Festus Chuka, for property in Asaba. But Chuka denied receiving the money.